In the conclusion to this epic interstellar adventure by Nebula Award nominee Wil McCarthy, humanity stands at a crossroads as the heroes who fashioned a man-made heaven must rescue their descendants from eternal damnation…. Once the Queendom of Sol was a glowing monument to humankind’s loftiest dreams. Ageless and immortal, its citizens lived in peaceful splendor. But as Sol buckled under the swell of an immorbid population, space itself literally ran out…. Conrad Mursk has returned to Sol on the crippled starship Newhope. His crew are the frozen refugees of a failed colony known as Barnard’s Star. A thousand years older, Mursk finds Sol on the brink of rebellion, while a fanatic necro cult is reviving death itself. 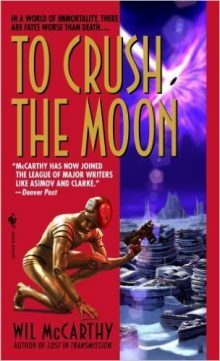 Now Mursk and his lover, Captain Xiomara “Xmary” Li Weng, are sent on a final, desperate mission by King Bruno de Towaji–one of the greatest terraformers of the ages–to literally crush the moon. If they succeed, they’ll save billions of lost souls. If they fail, they’ll strand humanity between death–and something unimaginably worse….